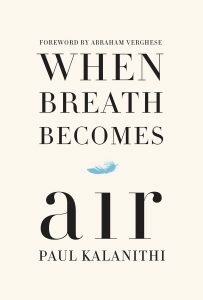 When Breath Becomes Air is the deeply moving story of Dr. Paul Kalanithi, neuroscientist/neurosurgeon, patient, husband, father, son, brother, lover of literature, and, most of all, lover of life itself. He started writing his memoir once he was diagnosed with advanced lung cancer in 2013. He was only 36-years-old then, and he continued with his writing until he passed away 22 months later, survived by his wife, Lucy, and his 8-month-old daughter, Cady. The book has been a New York Times best seller as well as winner of numerous prestigious awards. While reading When Breath Becomes Air, I could see, between the lines, the author’s hunger for more servings of this delicious meal called life. It was justly so, for at the age of 37, it was just too soon for him to leave the table of life’s banquet. He was still immersed and glued to life with ambitions, goals and dreams. His heart was very much overflowing with love for his career, for his family, and, more than ever, his love for literature, which allowed him to tell his story and romantic life so profoundly and so beautifully before they slipped away from him. At times, in the middle of reading a paragraph from the book, I wished that he could stop the despair, unplug and unglue himself from what was here and now. I wished he could instead look away and put his focus on all the wisdom taught to us, like how by death, we all become eternal, like a drop of water which joins the ocean, only to become larger and absolute. I well understand that even turning to philosophy and spirituality, while standing in the doorway of your own mortality, could only be a Band-Aid on a bleeding, deeply injured wound. Reading When Breath Becomes Air, one cannot argue with the fact that in the case of Dr. Paul Kalanithi, death indeed knocked at the wrong door and called the wrong name. The world needed Kalanithi’s brilliance and talent. Even in death, he managed to touch our lives. I advise you to go and read the book and judge for yourself!